Do you know a denture-wearer who has trouble speaking, eating or achieving comfort and stability with either their upper or lower dentures? Do you know someone who avoids social situations out of embarrassment, and who thinks loose dentures are just an inevitable — and untreatable — part of growing old? Is there someone you know who hasn't considered implants because they think they are unaffordable or more appropriate for a “younger” person? If the person you're thinking of is you or someone you know, we have two important facts to share with you: first, you are not alone; and second, dentures — or a full set of dental implants for that matter — aren't your only options to treat complete or partial tooth loss. There are new solutions to this old problem. Despite enormous advances in modern dentistry, partial or complete edentulism (the loss of teeth) continues to be a major public health problem. According to the World Health Organization, edentulism is defined as a physical impairment (because important body parts have been lost), a disability (because it limits people in performing at least two essential tasks of life — speaking and eating) and a handicap (because significant changes are needed to compensate for such deficiencies). This impairment has all the characteristics of a chronic disease — it doesn't change or abate, is incurable and requires specific management strategies to overcome its disruptive effects. For well over a century, complete dentures have been the traditional standard of care for edentulism with its focus on replacing lost tissues (teeth, bone and gum tissues), though not necessarily function. Studies indicate that most people are more satisfied with their upper (maxillary) denture as compared to the lower (mandibular) one. And at least half of all lower denture wearers will not be satisfied with their retention (stability) or comfort. It is important to understand why this occurs and what happens when teeth are lost. It's actually all about bone. When teeth are lost the supporting bone of the tooth undergoes remodeling (reshaping) for the first several weeks as part of the normal wound-healing process. However, this continuing process will lead to a significant loss in the shape and height of the remaining bone (known as resorption), so that dentures fitted soon after tooth loss quite rapidly become loose. 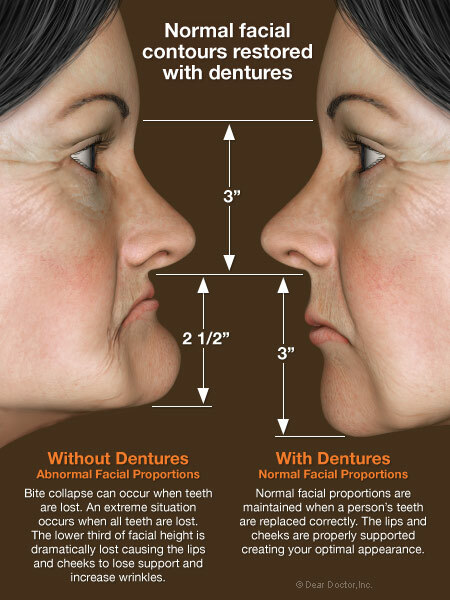 The amount of bone loss is four times greater in the bottom jaw than the upper and most rapid during the first year. 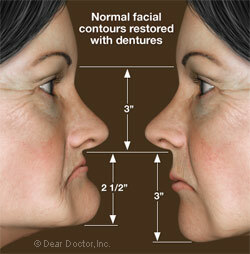 It is this basic biology that explains why dentures become looser over time. 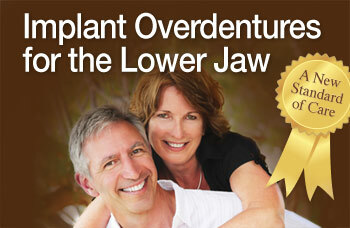 Lower dentures are much more difficult to wear with confidence than upper dentures. While the bone support is critical, the tongue is a powerful muscle and easily can displace a lower denture whereas the upper denture has more retention due to the large surface area and suction effect of the palate. Statistically, edentulous people are at a nutritional disadvantage as compared to those with natural teeth. Many people decide to address this problem themselves with the use of dental adhesives or creams. Not only is there an enormous long-term financial cost to this approach, but it also may not be healthy. There is some preliminary information that questions the safety of excessive use of dental adhesives because of the ingestion of zinc (a major ingredient in most adhesives) and its possible association with neurological disorders. Although this possibility exists, it is somewhat unclear and much more research will be needed on this topic. If you need excessive amounts of adhesives to stabilize your dentures, please see your dentist and discuss your options just to be safe. In addition, when comparing patients with and without teeth, it has been shown that edentulous people generally have difficulty chewing foods tough in texture and may even modify their diets in unhealthy ways by eating less vegetables or protein, instead eating foods with higher fat content that are easier to chew. Statistically, edentulous people are at a nutritional disadvantage as compared to those with natural teeth. Edentulism can negatively impact a patient's overall quality of life. Assessing quality of life is complex — its attributes include adequate functional and psychological health, life satisfaction and self-esteem. Edentulous patients with dentures, particularly those who have adapted to the treatment poorly, can encounter severe psychological and social consequences. The original goal of implant treatment was to help patients avoid dentures altogether by treating their impairment with a non-removable or “fixed” prosthesis (tooth replacement device) supported by dental implants. Dental implants replace the root parts of teeth that are anchored in the bone, below gum level, allowing attachment of the crown portions of teeth — the visible part of teeth you can see. And while this approach has helped many people, not all patients are candidates for this treatment. Many times it does not address all the deficiencies caused by tooth loss, or satisfy cosmetic needs; and for some, it is economically unrealistic.